Photos of endangered island foxes are few and far between. This island fox in profile from Santa Cruz Island is courtesy of photographer Kevin Schafer. Video of island foxes is even harder to come by. The following links will take you to video of and about Channel island foxes. ARKive.org is an international library of images capturing the natural world. This remarkable resource links to Friends of the Island Fox and we are returning the compliment. Their video includes night vision of an island fox going into a sea gull colony and taking an egg. 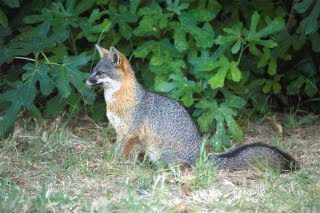 Channel Islands National Park also has a slide show of island fox photos including pups.